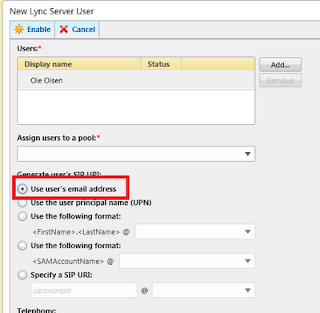 There are certain scenarios where I would like to provide Lync for users who belong to a different forest than the Lync installation is in. If you can set up a trust and federation between the two forests, then all is well. “All” you have to do, is to follow the following for the users in the separate forest: http://technet.microsoft.com/en-us/library/gg670909.aspx. Or if you also host Exchange services (in the same forest) for the customer, you should not run into any issues. 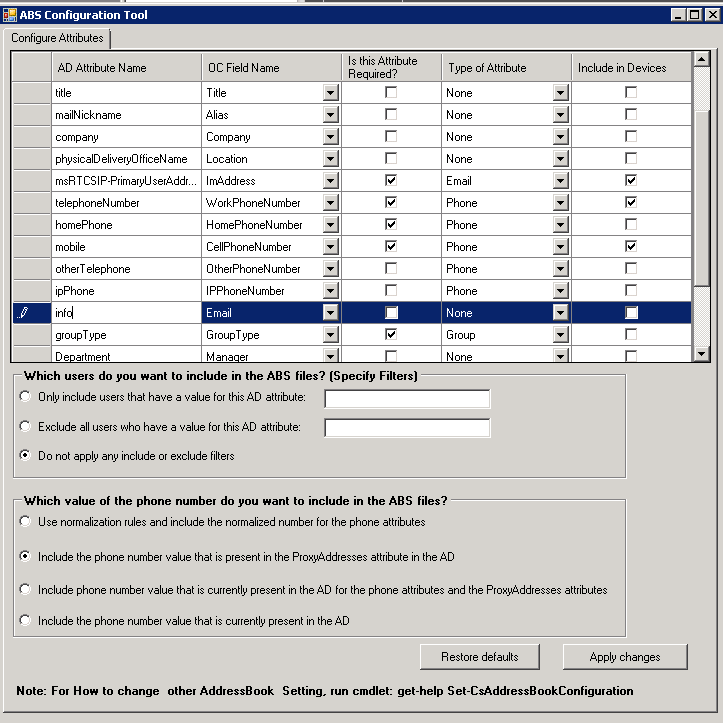 If the customer has not deployed EWS, the Lync client will not find any EWS and default to MAPI. Except for some missing features (I will get back to), “all” is well. 3. 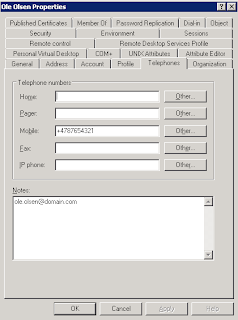 If the customer has deployed EWS and it is reachable by the Lync client, the authentication fails and MAPI is not used. The two first scenarios are not too common, but would give most of the functionality for the user (The user might be prompted once for logon with MAPI credentials. 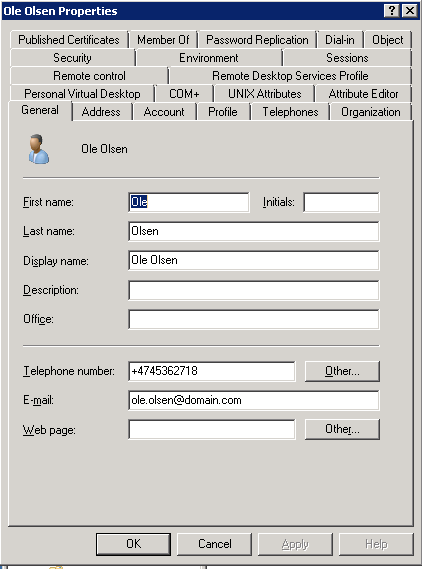 The 3rd scenario is (in my experience) the most common scenario, and renders the Lync client without any integration at all. 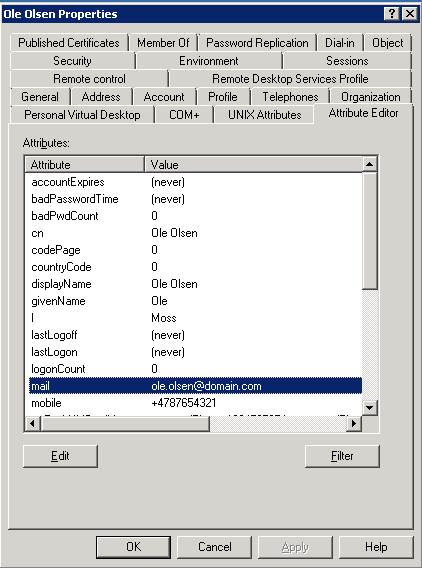 As it turns out, when the Lync client tries to access EWS it uses the same credentials it has stored for the Lync client logon. It will not prompt you for correct credentials if EWS authentication fails. And it will not fall back to MAPI, as it sees the EWS as up and running. (While if EWS is not available, and MAPI is chosen you will get prompted for credentials if logon fails). I’ve been looking far and wide for a way to force the client to use MAPI instead EWS in these scenarios. And after a lot of research and quite a few emails with Microsoft support, I have finally been able to “trick” the Lync client to use MAPI. All of this is taken from the following guide: http://technet.microsoft.com/en-us/library/gg398806.aspx (You should read it before thinking of doing what is later described in this post, as the article will be updated as the product might change). If you read the the rest of the blog, and try to implement this in your own system, you do so on your own risk. This solution is no way supported by Microsoft in any way, nor by me. But I have tried this setup in three systems that all work as expected. 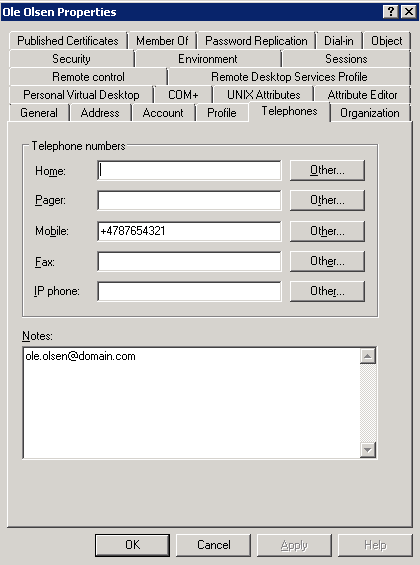 The key to trick the Lync client to use MAPI is to understand how the Lync client tries to access the Exchange EWS. 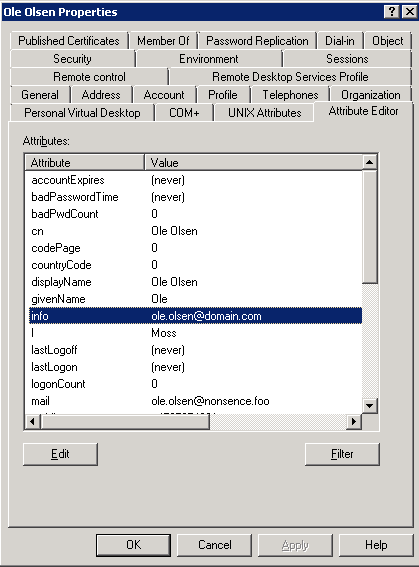 The lync client uses the Active Directory user object’s mail attribute to find the email server. It will use the mail attribute to start the auto-discover process to find the exchange services. 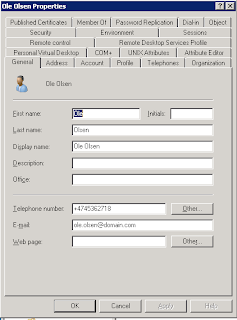 If the attribute is empty, it will simply not try to connect to Outlook or Exchange. At least that is what I have experienced. 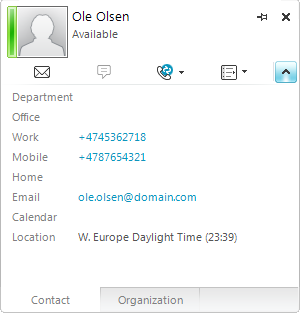 The easiest part in tricking the Lync client is putting a fake email address/domain in the mail attribute. Something like absolute@nonsence.foo (important: domain must not exist, now or ever). 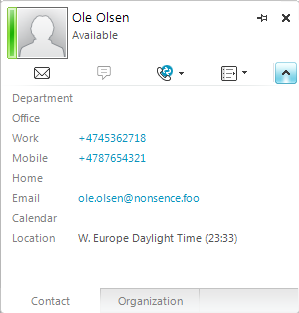 Once this is done, the Lync client will try to autodiscover the “nonsence.foo” domain and fail. It will state: EWS not deployed, and fail over to MAPI. But by resolving one problem, we create ourselves another problem; The generated address book will show the fake address, and client interaction (such as sending email) will not work at all. To solve this problem, you need to alter from which field the addressbook service populates its data. It turned out this was just as simple as the previous task. 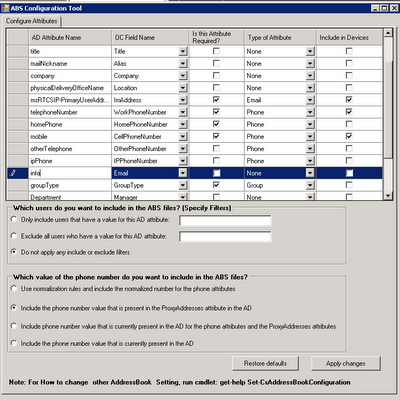 I downloaded, and used the address book configurator from DrRez: http://blogs.technet.com/b/drrez/archive/2011/01/31/microsoft-lync-server-2010-resource-kit-tool-absconfig.aspx. First I chose a different user property to populate with the correct email address (I often use the “info” field). 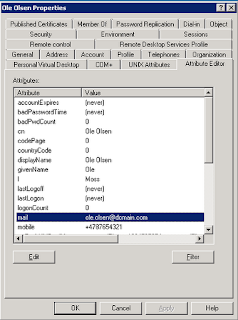 Then, I launch the absconfig and change the email value. !Warning #2! 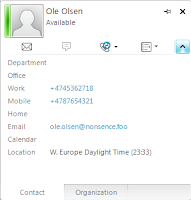 The absconfig was written for OCS, not for Lync. It works for changing fields, but under no circumstance should you try “restore to default” (or try any of the other features in the tool, it will possibly mess up your system. Read more about it here: http://waveformation.com/2011/02/11/restore-lync-abs-default-configuration/ if you should have done so before reading my warning. I did, and I used this post to repair my system). Very nice post, really! This single article revealed a lot more about the tight relationship between Lync the EWS and the MAPI, than the whole Lync Resource kit book written by those so-called Microsoft "experts"
"The lync client uses the Active Directory user object’s mail attribute to find the email server"
The ABSENCE of this sentence in the whole Lync product documention (including the ITPRO.chm and the whole Resource Kit 20 chapters) caused me wasting 3-4 weeks at a customer to find the reason why some of their users were unable to acquire EWS connectivity to retrieve their voicemail list. Fantastic article and is exactly what a client of ours is looking for. Can I assume that the ABSConfig change only needs to be applied once and when new users are enabled for Lync, the email address field within the Lync client will sort itself over time (providing the AD attributes have been modified)? Alternatively, will Update-CSUserDatabase and Update-CSAddressbook commands have to be run each time? When you use the ABSConfig file, you alter the Database (and yes, it's permanent).